» What’re those? Answer: Look it up! What’re those? Answer: Look it up! 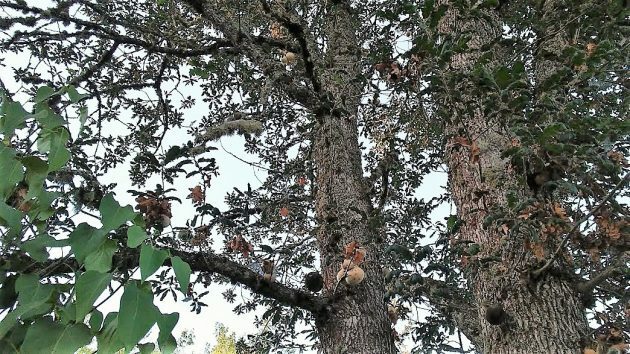 Those round things on oak trees in West Albany are mysterious only if you don’t know what they are. I couldn’t remember what the tennis-ball-sized structures in these oaks were called, or indeed what they were. So I looked them up. They are, of course, oak galls. And they are caused by Cynipid wasps. There are more than 200 species of this family of wasps in the American West. This I learned from an online fact sheet on oak galls put out by the Oregon Department of Forestry. What does this do to the oaks? It may gall them no end, but it doesn’t hurt them very much. Sometimes the affected branches die, especially when squirrels have peeled the bark in the hunt for larvae. But the damage is mostly cosmetic, and the Forestry Department does not recommend using pesticides to fight the wasps. Interesting. I wondered what caused these growths. There seems to be more of them on our oak trees this year. Glad to hear it does not hurt the tree too much. Thanks.